National Harbours Board. Used - Good. Former Library book. Shows some signs of wear, and may have some markings on the inside. Saint John N.B. : National Harbours Board, 1982. Light tanning of pages, first of 2 volumes, large softcover with 333 pages including index, light edgewear. 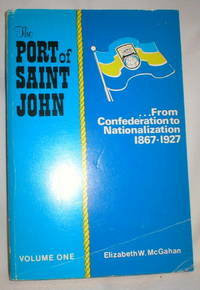 A very good historical reference to the history of the Port of Saint John.. Soft Cover. Very Good/No Jacket. 6x9". History/genealogy. 5 fldg. maps Part One: 1867-1879, Market Slip-Long Wharf: The Atlantic Years of a Maritime Port; Part Two: 1879-1895: Reed's Point-Lower Cove: The Transitional Years of an Interstitial Port, Part Three: 1895-1911, The West Side: The Continental Years of a National Port, Part Four: 1911-1927, The Port of Saint John: The New Years of Vertical Integration. Saint John, N.B. : National Harbours Board, 1982 Original blue card covers. A hefty and well-documented volume of the port's history. 333 pp.. First ( No Additional printings). Soft Cover. Very Good/No Jacket. Illus. by Foldout Maps. 8vo - over 7¾" - 9¾" tall. Saint John: National Harbours Board, 1982. Book. Fair. Soft cover. 8vo - over 7¾ - 9¾" tall. Volume I only of two. 333pp., index, biblio., notes. All five folding maps are present. Moderate wear and scuff to covers, worn edges. Interior clean and binding sound. .
National Harbours Board, 1982. Good.